How often should you check your email? 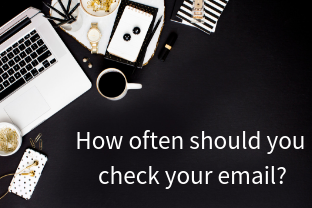 How often should you check your email? At least twice per day. I probably check my email way too much. Set up automatic replies, when you’ll be on vacation or just slow on responding for a short period of time. Check out my holiday auto reply. Tis' the season to be spent with family and friends. Please excuse my late replies throughout the month of December, as I spend my days chugging mugs of hot cocoa, baking cookies, tree decorating, attempting to ski (again), knitting ugly sweaters, and most importantly cherishing time with my family. I’ll be back in front of my computer full-time again, starting on January 1, 2019 and will respond to your email then. If you need immediate assistance, please don't hesitate to give me a call on my cell (917) 881-3701. I ain't shady! I won't share your contact information with any third parties.